An island hopping escape to even a few of the 118 islands and atolls in this South Pacific paradise is not only the ultimate escape from northern winters, it's the trip of a lifetime. 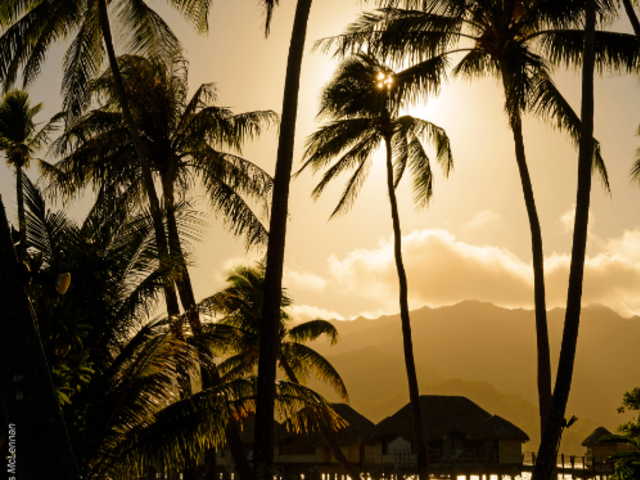 Picture your arrival, welcomed by Tahitian music and fragrant Tiare flowers… and use these highlights of some of the key islands to start planning your island hopping fantasy escape:They call the island of Tahiti 'The Queen of the Pacific'. It's the largest and most populated island, and is the starting point for travelers, who fly into the capital city Papeete. Don't miss Marae Arahurahu, an ancient Tahitian outdoor temple, or, in the centre of town, the market with tropical produce and fresh local fish and Tahitian arts and crafts, including the biggest selection of pareus (sarongs) in the country. Outside the city, Tahiti boasts spectacular scenery: lush green peaks tower over cascading waterfalls and rippling pools in the interior, and black- and white-sand beaches and turquoise lagoons at the sea.